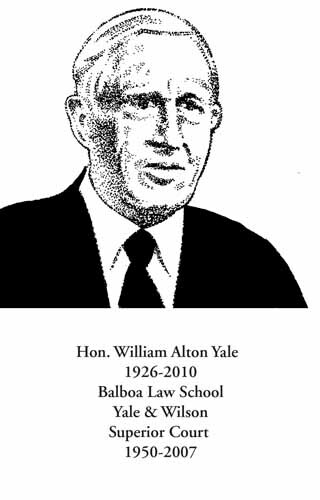 Judge William Yale was born in San Diego County and attended Hoover High School, San Diego State College, Balboa Law School (a predecessor to California Western School of Law) and was admitted to the bar in 1950. He served in the U.S. Navy and was honorably discharged in 1945. He had an excellent reputation as a lawyer specializing in real property for 20 years and was a partner in the Yale & Wilson law firm specializing in complex civil litigation including real estate and development financing. He was elected to the San Diego County Bar Association Board of Directors and served as president in 1969. Shortly after completing his term as president, he was appointed by Governor Reagan to the Superior Court. He was elected Presiding Judge, and was consistently identified as one of the most popular judges on the San Diego Superior Court. Of the many awards recognizing his contributions to the justice system and the community were being named Judge of the Year by the San Diego Trial Lawyers Association in 1977, and being recognized as the Legal Professional of the Year by the City Club of San Diego in 1996. Committed to the ideals of justice, Judge Yale spearheaded a program to solve the problem of the unmanageable number of civil cases awaiting trial in 1977. He organized and administered an innovative settlement conference format which, by settling 75% of the cases heard, saved hundreds of thousands of dollars to tax payers and resulted in the speedy resolution of cases for many litigants. Upon his retirement from the Superior Court in 1981 he became Special Counsel to the law firm of Luce, Forward, Hamilton & Scripps, LLP and established an excellent reputation as an independent mediator. He continued in that role until he retired from the law firm in 2007. He was a quality lawyer and leader, with a warm personality, and a myriad of friends.